An alumnus of the Film & Television Institute of India and Berlin Talent Campus, Pushpendra began his career as an actor playing one of the leads in Amit Dutta’s Venice award winning film ‘Aadmi Ki Aurat Aur Anya Kahaniya’. He then went on to assist Amit Dutta on his next feature ‘Nainsukh’ and the latest ‘Sattvi Sair- The Seventh Walk’. 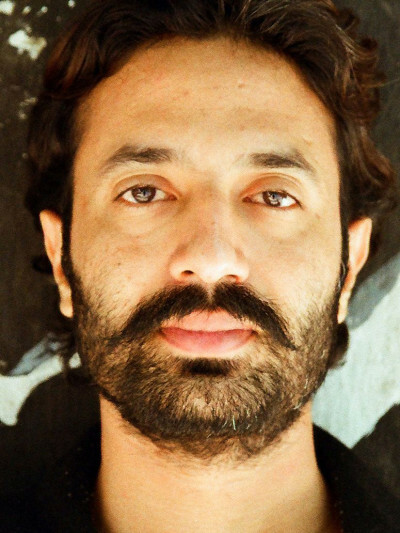 He has also assisted Anup Singh on his feature ‘Qissa- The Ghost Is A Lonely Traveler’. His film ‘Lajwanti’ (directed, produced and acted by him) and Ich Will Mich Nicht Künstlich Aufregen Aka Asta Transfer ( as an actor) directed by Maximilian Linz premiered at the 64th Berlin International Film Festival in 2014. Currently he teaches at Film & Television Institute of India in the department of Acting. I studied in a boarding school where every Saturday we were shown Hindi movies. Occasionally we were shown a Malayalam or an Hollywood film. But, it was during the vacations that once I saw ‘Pather Panchali’ on Doordarshan and related to the images despite it being in Bengali. I started watching regional classics on Doordarshan since then. I looked forward to watching ‘Gandhi’ every October 2nd on Doordarshan. I was fond of literature since my childhood. Raduga Publications from Russia would come to our school with Hindi and English translations of the Russian folk tales and I started collecting those books. It was while working with Barry John in his theatre group in Delhi, we would not only act but even direct small acts based on certain themes. Barry exposed us to Cinema outside India and since then I was interested in directing a film one day. I joined FTII in the acting course mainly because it offered an integrated course in film-making before moving into your specialization. It is at FTII, I realized that directing a film needs an understanding of not only the craft of cinema but other art forms and life itself. I started reading about the masters whom I loved and also began to develop an interest in other art forms. I’ve assisted Amit Dutta and Anup Singh on their films. I think assisting not only helps in understanding of the craft better but also it prepares you into the art of team work which essentially is making films all about. I was doing an experimental performance using video which traveled to a few places. I decided to develop another performance using the technology of video and started reading stories for it. But while reading a volume of Vijaydan Detha’s short stories, I realized that it was better directing a film on them. I shortlisted two stories and contacted Bijji ( Vijaydan Detha is fondly called as Bijji) and went and met him. He gave me the rights of ‘Lajwanti’ but only for two years. The deadline of two years pushed me into actively seeking a producer for the film but I could not find any. That is when I decided to self produce the film. Tell us something about crowd funding. Do you think the process can be improved and become a larger contributor to a film’s budget? I partly crowd funded my film during the Production and Post-production of the film. I definitely feel that the process of crowd funding can be improved a lot. Indians are used to giving ‘Chandas’ to temples, hospitals, religious ceremonies, college parties etc. If people are used to donating for such purposes, why can’t we ask them for our film. But the problem is that people hesitate to donate small amounts without realizing that the idea behind crowd funding is to collect small amounts in large numbers. Also, earlier we had the patronage system for the arts which has declined, so connoisseurs of arts have to come forward to support such artistic works. We also have to let go our shyness in asking for money. After all we are asking money not to make profits. I feel a larger awareness is required in terms of crowd funding. I remember during my sister’s marriage, many relatives and people known to my father had gifted ‘lifafas (envelope) of rupees’ which really helped in managing the expenses. My father still checks the diary and gifts a ‘lifafa of rupees’ to the person who gifted him when he/she has a marriage in their family. How do you decide on a film subject. What are your inspirations? Is film direction intuitive or is it something you learn? I am fond of reading literature. If a story interests me, I always start imagining a film out of it. I made ‘Lajwanti’ the same way and now wants to make another film on another story of Vijaydan Detha. Of course, these stories also appeal to me because I feel they are close to my life in some way. I have also written a script which is based on my own experiences and my acquired memory. Folk literature is a big inspiration for me. Intuitiveness is a quality which I feel you require even if you’ve learnt something. Definitely, one can learn direction if one has the drive. Do you think the audience is perceptive about how a director establishes a mis en scene in the sense of time and space? I feel audience is not something which is homogeneous. We have all kinds of audiences. So, if one kind of audience does not understand, there will be another which will. I myself watched popular movies when I was growing up but when I developed a taste for Cinema, I stopped watching them. I changed myself as an audience over the period of time. Film is a director’s medium, though it is often looked at as driven by Film stars. How do you deal with it? I think there are many kinds of films. Commercial movies are driven by film stars because they have to earn huge profits out of them. I do not belong to that system so I haven’t faced that challenge. Film technology is continuously changing. Do you think it affects you as a director, in the way you want to tell stories. I feel if technology is getting cheaper, it will only help a film-maker. I am really glad it is changing. I can now tell stories without worrying about raising huge amounts of money to do that. I’m nostalgic about the celluloid film but I’m ready to adapt my story to the new medium. Your favorite films or directors? At least two of them? There are many films and directors which I’ve liked. The two names which come to my mind right now are Robert Bresson and Victor Erice. Any hurdles you have encountered in your journey. Things that are blocks in a achieving your vision while making your film. I am lucky to be supported by a fantastic cast and crew and friends who helped me a lot during the making of my first film. Raising finances is the only thing which I see as a block. I have realized you have to take life as it goes on and start living in the present. That is why I do not prepare wish lists. Life isn’t easy anywhere so one has to accept that reality and give one’s best. There are two fiction feature projects I’m working on right now. ‘Ashwatthama’ was selected at the Co-production market at Film Bazar, Goa and I’m talking to finalize co-producers for that. Sanjay Gulati of Crawling Angel Films who co-produced Lajwanti has agreed to produce the film based on Vijaydan Detha’s story. I am also working on a documentary on the Manganiyars which has been selected for the pitch at Docedge, Kolkata. There’s also Project Lajwanti where I will present variations on the story of Lajwanti and a video installation. Any advice to the inspiring directors? Develop a taste for your local arts. And read a lot. I’m listening to the Manganiyars whom I’ve recorded recently. I’m reading Conversions and Shifting Identities: Ramdev Pir and the Ismailis in Rajasthan by Dominique Sila Khan. I’m watching Rainer Werner Fassbinder nowadays.